We developed a compensation system for dc-coupled magnetometer sensors which allows sensitive eddy current measurements above 80 Hz in presence of strong and slow varying background fields. Different magnetometers like fluxgate and SQUID have been used successfully in NDE systems based on eddy current excitation, when searching for defects in conductive samples like aircraft parts. Due to their high and frequency independent field resolution of a few pT/ÖHz and their excellent spatial resolution, dc-coupled magnetometers provide a more sensitive crack detection in the case of deep lying defects - compared to other conventional electromagnetic. NDE systems. Test objects containing ferromagnetic structures with a high remanent magnetization up to several mT, like aircraft wheels or steel bolts in part of the aircraft wing, require a very large dynamics of the dc-coupled magnetometer. To prevent the sensors from being saturated, we have developed a new background field compensation scheme. If the dc field approaches the saturation value of the sensor, a low-pass-filtered counterfield controlled by an 8-bit counter is applied to compensate the slowly varying (<30 Hz) background field, thus enhancing the dynamic range by a factor of 256 without increasing the noise at the eddy current frequency. With this system, eddy current measurements were carried out on both aircraft wheels containing steel keys with high remanent magnetization and aircraft lap joints with steel bolts. In this case, we used different types of rf-SQUID magnetometers as dc-coupled magnetic field sensors. A dynamic range of 184 dB/ÖHz was reached. We present the detection of small, deep lying cracks in different kinds of aircraft samples. Current research in eddy current NDE systems based on sensitive magnetometers [1-6] has proven their superiority over conventional systems, when searching for cracks in a depth of 10 mm or more. Since magnetometers like Superconducting QUantum Interference Devices (SQUID) and flux gate sensors in general have a very high magnetic field sensitivity [7,8], which is nearly independent of frequency, the advantages of such a magnetic field sensor are especially pronounced for low-frequency eddy current applications (100 Hz-1 kHz). The high dynamic range of more than 120 dB/Ö Hz allows one to detect small field changes in the presence of large background fields, produced e.g. by edge effects or inhomogenities in the conductivity of the samples. However, due to the high field sensitivity of about a few pT of sensitive magnetometer systems, a dynamic range of more than 180 dB/ÖHz is required in order to test aircraft parts containing ferromagnetic materials like steel bolts in the wing and steel bars in aircraft wheels. The read-out electronics then can easily be saturated by high remanent magnetic fields. The measured field strength of the steel parts of up to 1 mT exceeds typical detectable field values of up to ±30 µT of a conventional flux-locked-loop (FLL) electronics of SQUID sensors. Furthermore, the maximum detectable field strength of sensitive flux gate sensors is also limited to about 100 µT. The maximum dynamic range of a SQUID readout is mainly limited by both the voltage noise level of the integrator and its maximum admissible drive current. When using a too small feedback resistance or feedback coils with too large mutual inductance, the intrinsic noise of the SQUID is exceeded by the voltage noise of the integrator. In case of SQUID sensors with a periodic flux-to-voltage characteristics, a common technique to increase the dynamic range of a FLL is the employment of a field reset when the maximum detectable field value is reached . The number of resets are counted and added to the measured instantaneous field value. Nevertheless, this method is limited by the time delay of up to few ms for the reset procedure. For applications, which use higher frequencies of more than 100 Hz, the detected field values are inadmissibly effected by the time delay of the field reset. In our eddy current experiments we have used magnetometer systems, such as different kind of High Temperature Superconducting (HTS) radio-frequency (rf) SQUIDs made from Yttrium-Barium-Copper-Oxide (YBCO) thin films [10,11]. However, the described compensation measurements also can be performed with any kind of sensitive magnetometer, such as magnetoresistive sensors or flux gate probes. We mainly used a HTS microwave SQUID, having a field noise of better than 2 pT/ÖHz at signal frequencies above a few Hz. Depending on the environmental noise the overall system sensitivity is between 1-5 pT/ÖHz For cooling the SQUIDs down to 77 K, we used both a portable cryostat or a Joule Thomson cryocooler. In one configuration the dewar is mounted to the moving part of a x-y stage, which provides a scanning range of 1 m2 and a maximum scanning velocity of 20 cm/s. For smaller samples, another x-y scanner moves the sample under test below the fixed cryostat, resulting in somewhat smaller vibrational noise. For measuring the z-component of the magnetic field above a flat test object, the SQUID is attached horizontally to the bottom of the sample holder inside the cryostat. The distance between SQUID and room temperature sample is about 4 mm in case of the cryostat and about 5 mm when using the machine cooler. To achieve as high a dynamic range of the SQUID system as possible, we generally used a gradiometric excitation coil having the shape of a double-D . When the SQUID is placed above the centre of such a coil, it sees only a fraction of the excitation field that the sample under test is exposed to. We achieved a reduction of the excitation field at the SQUID of up to 1000, compared to the field at the sample under test, which preserves the dynamic range by three orders of magnitude. By means of a large double-D excitation coil and a high excitation field of up to 0.5 mT (45 mm dia., 200 turns, 200 mA, 80 Hz), a 40 mm long and 1.2 mm high crack could be detected below two aluminium plates with a thickness of 25.4 mm in total (see Fig. 1 and 2). In this case, the signal to noise ratio (SNR) was still better than 80. 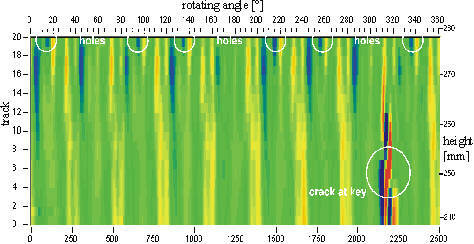 The same crack in a depth of 13 mm could be detected with a SNR of nearly 3000. The SQUID based NDE system could detect cracks, which are located in a depth of 13 mm with a SNR 400 times better than a conventional NDE system with induction coils as field sensors . The crack in a depth of 26 mm was not detectable by a conventional eddy current system. Up to now, cracks with a length of 15 mm and a height of 0.6 mm can easily be found in flat aluminium samples. The detection of smaller defects is mainly limited by artefacts due to inhomogenous conductivity of the sample. Fig 3: Basic principle of the compensation technique. Fig 4: Schematic drawing of a compensation system for slowly varying high remanent background fields. Fig. 4 shows a detailed block diagram of the compensation electronics. In order to compensate only slowly varying magnetic fields and not that of the eddy currents, a lowpass filter with a cut-off frequency of 40 Hz is used in front of the comparators which detect whether the magnetic field at the SQUID has exceeded a certain positive or negative value. When the SQUID read out exceeds one of these two thresholds, a counter is decremented by one bit when exceeding the upper threshold or incremented when exceeding the lower threshold. A digital-to-analog converter (DAC) translates the state of the counter into a current which is passed through a second compensation coil mounted close to the SQUID. In order to prevent the FLL from unlocking during a compensation flux change, a lowpass filter smoothes the edges of the - otherwise steplike - current change. This lowpass filter also substantially reduces the high frequency noise(>40 Hz) of the compensation electronics, which otherwise would lower the sensitivity of the eddy current measurements. Finally, the lowpass filter also reduces harmonics of the compensation flux change to below a few pT at the eddy current frequency. A low noise amplifier allows one to adjust the amplitude of one compensation step between about 6 µT and 30 µT. When reaching the upper or lower threshold at ± 9 V, the SQUID output voltage then jumps back to 0 V.
When exceeding a threshold, the compensation field needs a few ms before the external magnetic field variation is compensated to less than a few percent. The maximum slewrate of the compensation system is mainly limited by the delay time due to the low pass filters. An 8-bit counter provides 256 steps which corresponds to a maximum compensation field of up to 5 mT. We have used lowpass filters of 8th order having a white noise level of 40 nV/Ö Hz, which results in a field noise at the location of the SQUID of about 10 pT/ ÖHz (see Fig. 5). The use of low pass filters made from low noise operational amplifiers with a noise of a few nV/Ö Hz would lower the noise level down to below the SQUID sensitivity. To obtain a smaller noise level, one can additionally reduce the mutual inductance of the compensation coil, resulting in a smaller maximum compensation field (lower than 5mT), which is often tolerable. Fig. 6 shows the harmonics of the compensation flux change for a step rate of a few Hz. One can see a noise level of about 18 nT for frequencies lower than 120 Hz. Due to the attenuation of the low pass filter of more than 70 dB at 120 Hz, an eddy current measurement at this frequency is not affected by the step like changes of the compensation field (lower than 6 pT at 120 Hz). Fig 5: Spectral field noise of the SQUID system with the additional compensation electronics at the state of 30 counts Fig 6: Spectral field noise of the harmonics of the compensation steps at a rate of a few Hz. In Fig. 8, an eddy current measurement is performed, using the compensation electronics to compensate the static background field of a steel bolt in part of an aircraft wing, with a remanent field of about 0.5 mT (Fig.7). Fig 7: Eddy current measurement of a steel bolt with noticeable remanent magnetization. Adjacent artificial crack in the middle layer (10 x10mm²). When the SQUID approaches the bolt during a line scan, the upper threshold is exceeded (Fig. 8a) about 40 times until the SQUID is situated just above the bolt. Each time the upper threshold is exceeded, the state of the compensation counter is decreased, leading to a step like increase in the negative compensation field (Fig. 8b). Each step corresponds to about 13 µT . When the SQUID is moved away from the bolt, the background field at the SQUID decreases again, the lower threshold is exceeded and the negative compensation field is decreased again. Thus Fig. 8b is a measure of the static background field of the bolt. Fig. 8c shows the eddy current measurement of the sample performed at the same time. Due to the excitation with a double-D coil a typical gradiometric bolt signal with an amplitude of 270 nTpp is observed, without any influences of the compensation procedure. Fig 8: A line scan above a steel bolt with remanent magnetization of up to 530µT. a): SQUID readout (µT- range), b): compensation output (µT- range), c): eddy current signal (nT- range). As shown in the sketch of Fig. 7, a crack (10 x 10 mm²) in a depth between 10 and 20 mm was introduced into the middle sheet of the bolted multilayer structure. Fig. 9 shows the two channels of the lock-in detection (in-phase signal (left) and in-quadrature signal (right)). One can recognize that due to the crack (indicated by dotted lines) deviations of the circular symmetry appear in both components of the lock-in detection. Another example where ferromagnetic components might cause a problem for SQUID sensors are the steel bars used as mount for breaks and heat shieldings in aircraft wheels (see Fig. 10 ). These ferromagnetic bars are attached at the inner side of the wheel. The distance between the steel bars and the SQUID is about 20-30 mm, resulting in a remanent field at the location of the SQUID of up to 70 µT. Fig 9: An eddy current A-scan above a steel bolt with high remanent magnetization (530 µT at the location of the SQUID, scanning velocity: 34 mm/s). First (left) and second channel (right) of the lock in amplifier. Crack in the middle alu-sheet (10 mm x 10 mm) in a depth of 10 mm. Double-D coil (30 mm dia., and 120 Hz). Fig. 10 shows a measurement of an aircraft wheel, using the compensation electronics to compensate static background fields of the steel bars. For rapid testing, it is desirable to perform the measurements with a high angular velocity, which results in fast field variations at the SQUID. Therefore, the maximum amplification of one compensation step(30 µT) was used leading to 2 increasing and 2 decreasing compensation steps for each bar (see Fig. 11a and b). The maximum time derivative dB/dt of the field strength of one compensation step at the SQUID is then somewhat lower than the maximum reachable slew rate (3.5 mT/s) of the FFL. Fig. 11c shows the eddy current measurement of the wheel with the steel bars, using an excitation frequency of 170 Hz. Due to the different permeability and conductivity of the bars, a periodic signal structure can be observed (with a separation of 60°). The wheel also contains three tapped holes (120°) with a diameter of 10 mm. A crack with a length of about 4 mm close to one of the holes leads to an additional distortion of the eddy current flow, which results in an increase in the magnetic response field of the excited eddy currents. Fig 11: A line scan of an aircraft wheel, containg 6 steel bars (with a separation of 60°), top: sketch of an aircraft wheel, a): SQUID readout, b): compensation output.c): An eddy current measurement of an aircraft wheel containing 6 steel bars (with a separation of 60°), having a remanent field at the SQUID of more than 60µT. Circular coil, 20 mm dia., 170Hz. The wheels were tested with an angular velocity of 120°/s, which is a common value in conventional aircraft testing. Faster scanning or larger background fields of the steel bars require a higher cut-off frequency of the lowpass filter, thus decreasing the delay time of the compensating response field. However, higher excitation frequencies then must be used in order to avoid any influence of the compensation procedure in the eddy current measurement. Several measurements on aircraft wheels were carried out in the wheel testing facility at the Lufthansa Base, Frankfurt/M. airport. An aircraft wheel testing system using a planar HTS SQUID gradiometer with Joule-Thomson machine cooling in conjunction with a differential eddy current excitation was used . It turned out that in the case of low remanent magnetization of the steel bars inside the wheel no additional compensation system is required. The maximum measuring field range of the conventional FLL of ±15 µT proved to be sufficient. Then, the compensation electronics remains in a constant state and no compensation steps are required. Fig. 12 shows an eddy current measurement of a wheel of an Airbus A300-600 aircraft. We used an excitation frequency of about 180 Hz with a drive current of about 130 mA. The wheel was tested with an angular velocity of 90°/s and a bandwidth of about 100 Hz in order to detect fast variations of the response field. A typical periodic pattern can be observed, which is due to the steel bars inside the wheel. The reference phase was adjusted to 90° for a suppression of the bar signals. The defect, located close to one steel bar, gives rise to a large magnetic field variation. Fig 12: Measurement of an aircraft wheel (Airbus 300-600), containg 9 steel bars (with a separation of 40°) using a HTS SQUID gradiometer and differential excitation coil. Frequency: 180 Hz. We developed a compensation system for sensitive magnetometers measuring in the low frequency range (DC- kHz). The system allows to perform eddy current measurements above 100 Hz in presence of strong and slow varying background fields with a dynamic range of 184dB/ÖHz. This new compensation procedure can substantially increase the dynamic range of any conventional readout electronics (e.g. the flux-locked-loop (FLL) of a SQUID read out) and allows unshielded eddy current measurements in the presence of high static background fields of up to 5 mT. For common aircraft samples such as steel bolts and wheels, the maximum slew rate of the compensation electronics of 1 mT/s prevents instabilities of the FLL, leading to an appropriate high scanning velocity of up to 40 mm/s in the case of the steel bolts and to an angular velocity of up to 120 °/s for aircraft wheel testing. For faster scanning or larger background fields, higher measurement frequencies must be used. The authors are grateful to W. Becker of Lufthansa and W.B.Klemmt of DASA for their support and assistance during measurements, for the providing of test samples and for numerous stimulating discussions. This work is supported by the German Federal Ministry of Education and Research (BMBF) under grants No.13N7427, 13N7429, and 13N7430. S. Cochran, G.B. Donaldson, C. Carr, D. McA. McKirdy, M.E. Walker, U. Klein, A.McNab, and B. Kuznik, "Recent progress in SQUIDs as sensors for electromagnetic NDE",in IOS Press, Amsterdam, 1995, 53. S. Tan, N. Sepulveda, and J.P. Wikswo, Jr., J. Comp. Physics, 122: 150-164, (1995). H. Weinstock and M. Nisenoff, "Defect detection with a SQUID magnetometer", Review of Progress in QNDE, 6: 669-704 (1986). R.Hohmann, H. -J.Krause, H. Soltner, Y. Zhang, C.A.Copetti, H.Bousack, A.I.Braginski, M.I.Faley,"HTS SQUID System with Joule-Thomson Cryocooler for Eddy Current Nondestructive Evaluation of Aircraft Structures", IEEE Trans. Appl. Supercond., 7, 3702, (1997). M. Mück, M.v.Kreutzbruck, U. Baby, J. Tröll and C.Heiden, Physica C 282-287, 407-410, (1997). J. Clarke, "SQUID concepts and systems", in NATO ASI: Superconducting Electronics, H. Weinstock and M. Nisenoff, Eds., Berlin: Springer-Verlag, pp.87-148, 1989. H. D. Hahlbohm, H. Lübbig,"SQUID - Superconducting Interference Devices and their Applications", de Gruyter Berlin, 1976. R.L. Forgags and A. Warnick,"Digital-Analog magnetometer Utilizing Superconducting Sensor", Rev. Sci. Instrum., 38, 214-220, 1967. Y.Zhang, M.Mück, K.Herrmann, J.Schubert, W.Zander, A.I.Braginski and C.Heiden, Appl.Phys.Lett. 60, 2303-2305, (1992). H.-J.Krause et al., -Mobile HTS SQUID System for Eddy Current Testing of Aircraft",Review of Progress in QNDE, 16, 1053-1060, (1997). M.v.Kreutzbruck, M. Mück, U.Baby and C.Heiden, "Experiments on Eddy Current NDE with HTS RF SQUIDs", Studies in Applied Electromagnetics and Mechanics, Vol 13, IOS Press Amsterdam, 165-168, (1998). M.v.Kreutzbruck, J.Tröll, M.Mück, C.Heiden and Y. Zhang, IEEE Trans. Appl. Supercond., 7, 3279, (1997).